Also known as Wayzata Boulevard, Interstate 394 is an east-west freeway linking Minneapolis with the western suburbs. 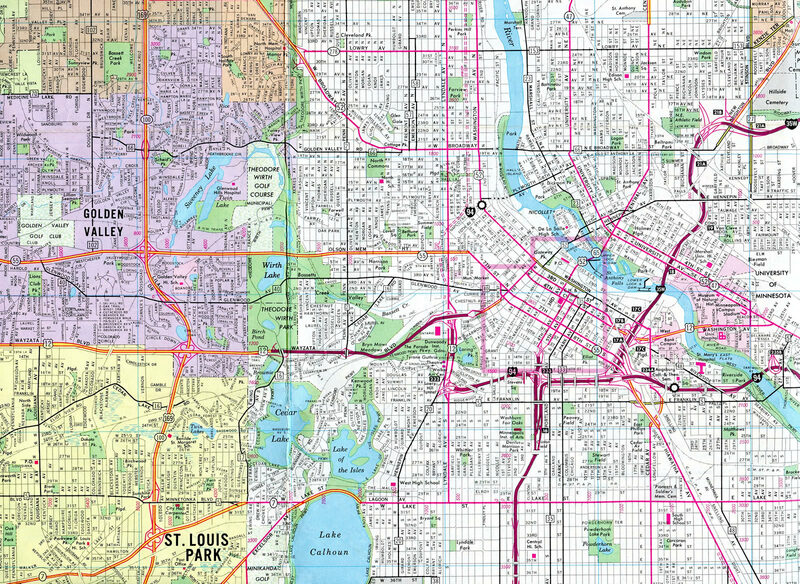 The Interstate replaced U.S. 12 for much of its length, excluding a short stretch west to Wayzata and the spur into Downtown. MnPass (HO/T) lanes run along the route through Minnetonka, Golden Valley and St. Louis Park to I-94 at Lowry Hill. The short freeway spur from Interstate 94 east to Washington Avenue includes three off-ramps serving the Loring Park, Downtown West and North Loop neighborhoods in addition to the ABC Ramps parking garages. 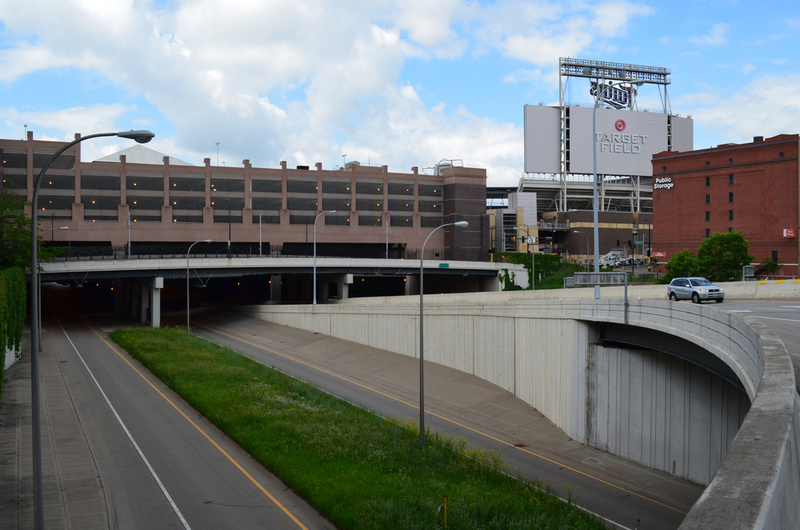 I-394 below Ramp B includes a tunnel section beneath a portion of Target Field. This may be the only stretch of Interstate that passes below a major sports venue. Photo taken June 15, 2015. The initial stretch of U.S. 12 freeway through Bryn-Mawr and Lowry Hill, Minneapolis in 1980. 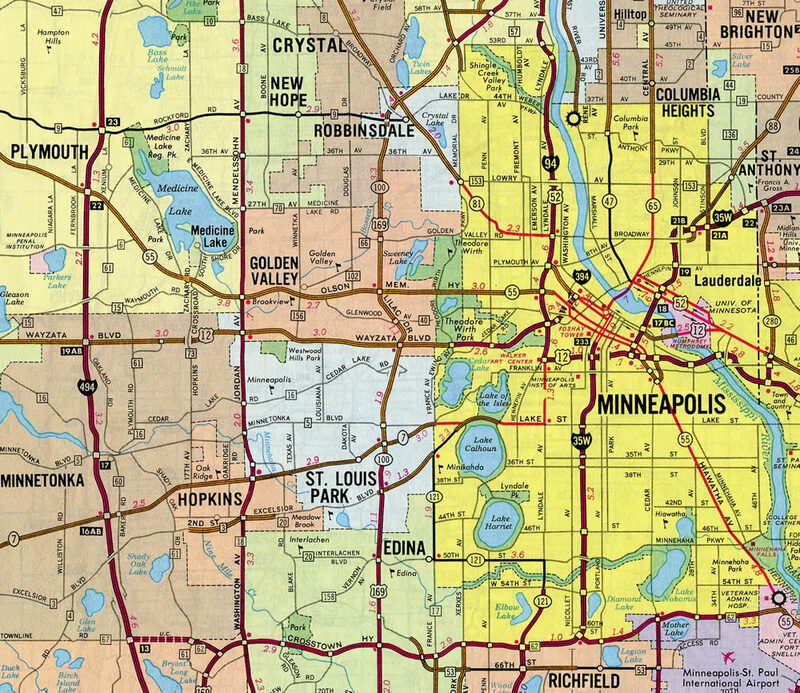 Interstate 394 shown as a short spur into Downtown Minneapolis – 1986 Gousha North American Road Atlas. 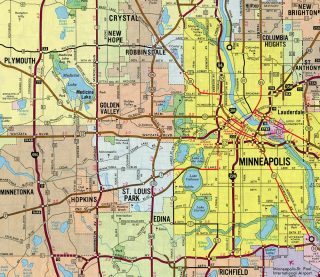 Interstate 394 was displayed on the 1983-84 Minnesota Official Highway map, but omitted on the Rand McNally North American Road Atlas at least through 1992. A turbine style interchange joins Interstate 394 with Interstate 94 on the west side of Downtown Minneapolis. Exit 8B departs for I-94 west to the Near North, Hawthorne and McKinley neighborhoods of north Minneapolis and east to Elliot Park, Ventura Village and Seward. U.S. 12 turns east onto I-94 here in an unmarked movement as well. Photo taken 06/14/15. As the skyscrapers of Downtown Minneapolis come into view, I-394 travels a viaduct over the I-94 mainline, Hawthorne Avenue and 16th Street North. The freeway reduces speed to 40 miles per hour and separates with Exit 9A to 12th Street North. Photo taken 06/14/15. Interstate 394 curves northward around Downtown West as the 12th Street North off-ramp departs. 12th Street North angles southeast to Loring Park and north to Glenwood Avenue. Exit 9B quickly follows to the first two I-394 parking garages. Photo taken 06/14/15. Interstate 394 drops below grade as it runs between Downtown West and the North Loop community to Washington Avenue. Photo taken 06/14/15. I-394 east expands to four lanes ahead of Exit 9B. The A Ramp parking garage occupies space above the freeway between 10th and 7th Streets North. Ramp B resides one block further east at 6th Street adjacent to Target Field (home of the Minnesota Twins MLB franchise). Photo taken 06/14/15. Motorists pass under Ramp A, North 7th Street and Ramp B to the final separation of ramps for 3rd Avenue North (Exit 9C) and the mainline end at 2nd Avenue North at 4th Street. Photo taken 06/14/15. Target Field, built between August 2007 and December 2009, extends partially over Interstate 394. A portion of the right field seats and Target Plaza, an open air park, extend above the freeway at the ramp split. The single lane ramp for Washington Avenue passes under the Ramp C parking garage to North 3rd Avenue. Photo taken 06/14/15. An End shield stands at the 4th Street North ramp intersection with North 2nd Avenue. This sign is not necessary correct, as the MnDOT route log equivalent lists the terminus instead at the Exit 9C end at 3rd and Washington Avenues.8 Photo taken 06/14/15. Separate panels for Exit 8B here were replaced with a single sign by October of 2007. The MnPass lanes connect with I-94 east via a flyover above. Photo taken 04/21/07. Sign replacements made here by August 2007 removed the light fixtures for both panels while shifting the exit tab for 12th Street North to the right. Photo taken 04/21/07. The mainline of I-394 defaults to 4th Street North beyond these replaced signs for Exits 9A/B. Photo taken 04/21/07. Sign replacements made for Exit 9B added the 14 foot 3 inch clearance for the approaching parking garages. Garage A and B was renamed to Ramp A and B as well. Photo taken 04/21/07. Soon thereafter, Interstate 394 east reached Exit 9B, 6th Street North to two of the parking garages (Ramps A and B). The two left lanes continued east to 4th Street North and Ramp C. Photo taken 04/21/07. Replaced overhead for Exit 9C attached to the 10th Street North overpass. The freeway passes below Ramp A here. Photo taken 04/21/07. This set of overheads adorned the west side of Ramp B. Construction of Target Field, which opened in December 2009, includes a paved plaza that protrudes over I-394 between Ramps A and B. This scene is now located under the structure. Photo taken 04/21/07. 2nd Avenue North runs beside a sky bridge linking Ramps B and C. Motorists leaving Ramps A or B are directed on the street to the North 3rd Street ramps for I-394 west and I-94 west. Photo taken 06/14/15. Dual turn lanes join the on-ramps for Interstate 394 west to Lowry Hill and Bryn-Mawr and a limited access connector to I-94 west at Near-North. Photo taken 06/14/15. 3rd Street North is discontinuous from I-394 to the Northstar Commuter tracks. The street instead splits into ramps for Interstate 394 west and the unnumbered freeway spur north to I-94 and Brooklyn Center. This long ramp is considered part of the Third Street/Fourth Street couplet and signed as “I-94 west”. Photo taken 04/12/07. Interstate 94 west emerges from the Lowry Hill Tunnel and splits with U.S. 12 west at Exit 231 for Interstate 394. There is no access for the I-394 spur into Downtown Minneapolis from this direction. Photo taken 06/16/15. Interstate 94 travels south from the split with I-694 at Brooklyn Center to enter the city of Minneapolis at the Lind-Bonhanon neighborhood. Following the Mississippi River to Hawthorne, the freeway curves westward to encircle Downtown by Loring Park. Exits 231A/B departs simultaneously for both I-394 & U.S. 12 west toward Golden Valley and Hennepin Avenue to Downtown West. Vehicles carrying hazardous cargo must depart here as well to avoid the Lowry Hill Tunnel. Photo taken 06/16/15. Interstate 394 travels west from a retail corridor anchored by Ridgedale Center mall directly to the full cloverleaf interchange with Interstate 494. Local Minnetonka exits precede and follow I-494 as U.S. 12 west emerges from the hidden status. Photo taken 06/15/15. An $8 million construction project completed on November 5, 2014 added a new westbound on-ramp to I-394 from Ridgedale Drive and the north side frontage road. Coinciding with the work was the addition of an auxiliary lane west to Exit 1C with Plymouth Road.5,6 The new lane leads directly to Exit 1B with I-494 north. Photo taken 06/15/15. An interchange sequence sign at the Plymouth Road overpass outlines the subsequent exits from the U.S. 12 freeway leading through Wayzata. Photo taken 06/15/15. A $1 million project between September and October 2013 reconfigured the exit ramps from Interstate 394 to both I-494 north and south. Movements to the belt line originally utilized a single lane c/d roadway. Now Exit 1B departs independent of Exit 1A.7 Photo taken 06/15/15. 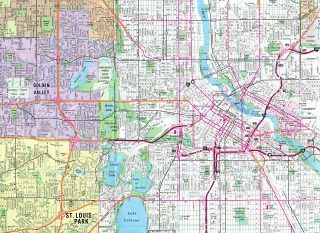 A collector distributor roadway parts ways with I-394 & U.S. 12 next for Interstate 494 south to Eden Prairie and the adjacent folded diamond interchange with Carlson Parkway north and Linner Road south. Photo taken 06/15/15. Interstate 394 formally ends as U.S. 12 takes over on the suburban freeway extending west through Wayzata. U.S. 12 eventually shifts to a two-lane alignment en route to Litchfield and Willmar. Photo taken 06/15/15. This sign bridge was replaced with a new assembly during the 2014 project to add the Ridgedale Drive on-ramp from Minnetonka. The expanded travel lanes now abut the adjacent retaining wall. Photo taken 04/12/07. The Carlson Towers Rotunda & Amphitheatre complex appeared as Exit 1A departed Interstate 394 & U.S. 12 west for both directions of Interstate 494. Exits were renumbered along this stretch in 2013 following the separation of ramps for I-494. Exit 1A is now Exit 1B. Photo taken 04/12/07. The old c/d roadway split with I-494 north to Maple Grove while leading west to I-494 south to Eden Prairie. Movements to I-494 south now depart from the freeway mainline just to the left. Photo taken 04/12/07. Frontage roads (Wayzata Boulevard) accompany the U.S. 12 freeway east leading to the collector distributor roadway for Carlson Parkway / Linner Road (Exit 1A) and Interstate 494. Exit 1C with CSAH 61 follows in two miles from I-394 as a toll schedule sign appears for the MnPass lanes leading toward Downtown Minneapolis. Photo taken 06/15/15. All traffic for Exits 1A (Carlson Parkway north / Linner Road south) and 1B (Interstate 494) departs from U.S. 12 east in unison for the c/d roadway. Interstate 394 appears here along side U.S. 12. U.S. 12 will disappear from ensuing signage as the freeway continues toward Golden Valley. Photo taken 06/15/15. Beyond the folded diamond interchange with Carlson Parkway, the U.S. 12 c/d roadway separates with the southbound ramp for Interstate 494 to Eden Prairie and Bloomington. Photo taken by Jeff and David Morrison (05/08/07). A loop ramp takes drivers directly onto I-494 north to Plymouth and Maple Grove. The mainline is now signed solely as Interstate 394, as U.S. 12 becomes unsigned here and along I-94 to the Wisconsin state line. Photo taken by Jeff and David Morrison (05/08/07). 1.75 miles south of Interstate 394 east and U.S. 12 on I-494 north at Exit 17 with Minnetonka Boulevard. Photo taken 04/12/07. An interchange sequence sign lies one mile south of Exits 19A/B with I-394 and U.S. 12 at the Stone Road and BNSF Railroad underpass. Photo taken 04/12/07. Interstate 394 leads east from I-494 and Minnetonka as a direct route from the western suburbs to Downtown Minneapolis. U.S. 12 extends the freeway west a short distance to Wayzata. Photo taken 04/12/07. Oakland Road passes over I-494 as part of the U.S. 12 frontage road system linking the Ridgedale Drive retail corridor with residential areas to the west. I-394 passes by Ridgedale Center mall as a busy commuter freeway en route to Golden Valley and St. Louis Park. Photo taken 04/12/07. Exit 19B follows onto the ending I-394 and U.S. 12 west. U.S. 12 leaves the I-94 corridor for good to Independence. Photo taken 04/12/07. Carlson Parkway angles southwest from Exit 20 to U.S. 12 (Exit 1A) just west of the forthcoming exchange with Interstate 394. Photo taken by Patrick Lilja (04/08/07). Cheshire Lane spans Interstate 494 south as Exit 19B parts ways for U.S. 12 west to Wayzata, Orono and Long Lake. U.S. 12 leaves the Twin Cities for Litchfield and Willmar. Photo taken by Patrick Lilja (04/08/07). U.S. 12 east transitions to Interstate 394 from I-494 east through Golden Valley and St. Louis Park to Interstate 94 in Minneapolis. Photo taken by Patrick Lilja (04/08/07). "Eastbound I-394 Lanes Will Open Saturday/Minneapolis-Wayzata Link Near Completion After 7 Years." St. Paul Pioneer Press (MN), September 27, 1991. “State OKs plan to try toll lane.” Star Tribune, November 6, 2003. "Frolic On Freeway Celebrates I-394." St. Paul Pioneer Press (MN), October 20, 1992. "No Pain, Slight Gain In The MnPass Lane – St. Paul-Minnetonka Commuter Gives The New Toll System A Go." St. Paul Pioneer Press (MN), March 9, 2005. "I-394/Ridgedale Drive Westbound On-Ramp Grand Opening." SRF Consulting, November 5, 2014. Minnetonka – I-394/Ridgedale Drive westbound on-ramp, Minnesota Department of Transportation (MnDOT) project web site. I-394 and I-494 Interchange, Minnesota Department of Transportation (MnDOT) project web site. US 12 West Metro (Adam Froehlig). Page updated February 25, 2016.